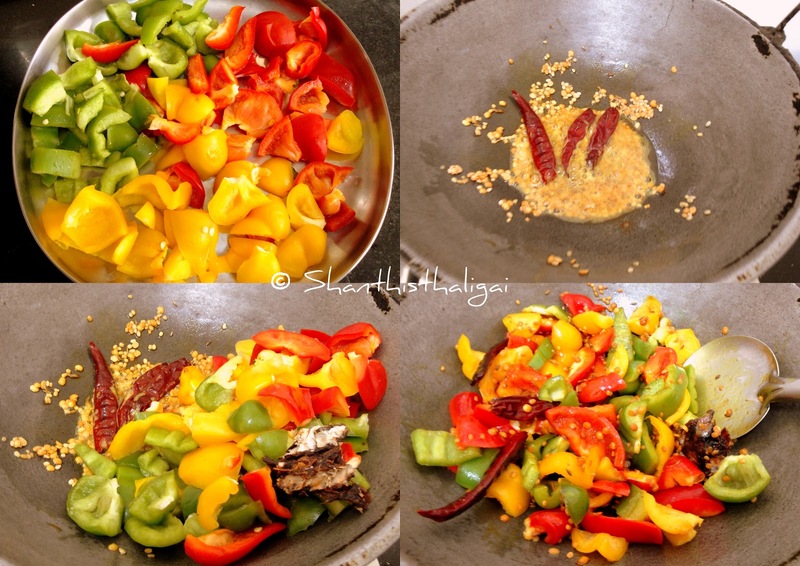 This is a flavourful and easiest chutney with tri colour bell peppers. Goes well as a side dish for all south indian breakfast. Heat a tablespoon of oil, add urad dal, toor dhal, hing and dry red chillies and fry until the dhals turn golden brown. Add chopped tri-colour bell peppers, tamarind and saute for a while until you see white spots on the bell peppers. When cool, add salt and grind in a mixie to a thick paste. Temper with mustard seeds and curry leaves. Serve with idli, dosa, rava dosa, Uthappam or arisi upma. NOTE : Capsicum can be substituted for tri color peppers. Chutney looks so nice.. I'll make it too.